Another project started for Gordon Murray Design in Shalford, Surrey. Our structural engineers have been busy working out calculations for the steels required to form the new opening for roller shutter doors into the new workshop. Gifford Grant Ltd is pleased and proud to have been awarded the contract to fit out MWR InfoSecurity 's new offices in Basingstoke. It will be great to work together again. Having relocated only two years ago, MWR InfoSecurity has grown so rapidly that new offices were a must. They are grabbing the opportunity to relocate to a prestigious building in Basing View. Gifford Grant has completed the contract to convert the reception area at HWM Alfa Romeo into a new showroom. The arrival of Jeep and Chrysler at HWM of Walton on Thames has given the business a great range of cars to sell alongside Aston Martin. Work has now started at Hartley Wintney Golf Club to provide new lighting and decoration to the bar and dining areas. Following a successful marketing campaign to attract new members to the stunning course, it was decided to bring the clubhouse up to the same high standard. Click to see the case study. This has to be the most fun fit out project in years! With amazing design detail, and input from the client, the end result at Whippet, Putney, is a dynamic and inspirational workplace. A project Gifford Grant is very proud of. Click to see the case study. Decoration is underway on site in Bracknell. Curved partition walls and feature TV walls will be decorated to match the colours in the offices in California. Partitions are built, feature drop ceiling being constructed, awaiting glass at Century Court in Bracknell for our American clients Telogis. Work is progressing smoothly and on programme, ready for the Portuguese furniture to arrive towards the end of the month. Just as we finish, the client asks for more. More, we say?? We'd be only too happy... Work starts Monday to create a new glazed meeting room at KSC Worldwide. KSC Worldwide Ltd has appointed Gifford Grant to fit out its new offices in Milton Keynes. Work commences late September, with a four week programme. The fit out of new welfare facilities at the 28th Odiham Scout Group Headquarters has been completed on schedule for the new term. When Tigglets Montessori Nursery School, tenants of the scout group, start their new term, the girls will be surprised by their grand and sparkly new bathroom. 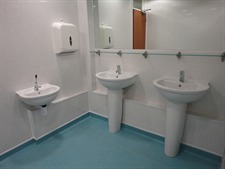 New toilets and basins were installed, including a low level child's basin, Polysafe safety flooring, and wall panelling reflecting a rainbow of colours. 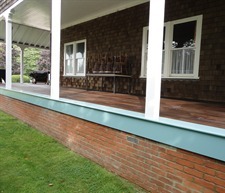 Gifford Grant was pleased to help with this local, community project. Whippet, the creative agency based in Putney, London, is gearing up to relocate its offices to new and exciting space. They will have to be patient though, as work only started yesterday! Once the strip out has started, all new electrical, data and plumbing services will be installed, raised floor, glazed partitions and feature lighting. Work began on site this morning to fit out part of Gifford Grant's local scout group headquarters. The 28th Odiham (Dogmersfield & Crondall) Scout Group is based in Crondall, Hampshire, in a building and land owned by the group. Gifford Grant is looking forward to providing the Beavers, Cubs and Scouts with newly fitted out welfare facilities for their return after the summer holidays. When Greycon, specialists in optimised production planning and scheduling, needed more office space, Gifford Grant was called in to provide expert advice. By introducing additional storage, electrical works and low level screens, the useable office was increased to suit the growing company. The successful relocation of Rigel Shipping, in London’s Docklands, was completed by Gifford Grant. The project also included the removal and recycling of their excess furniture. Rigel Shipping has awarded Gifford Grant the contract for its relocation to Canary Wharf, London. We are excited to be starting refurbishment work at the headquarters of the Dominion of Canada Rifle Association, Bisley Camp, Surrey. Alongside entries for brands such as Nokia, Apple and LK Bennett are Gifford Grant's entries for the Design Week awards for Stateside Candy Co, Guildford and Oak Barn Vets, Guildford. Take a look and wish us luck as the judging starts soon! 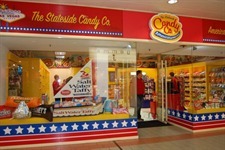 As The Stateside Candy Co go from strength to strength following the design and fit-out of its new flagship Guildford retail outlet, work commences on a new Aldershot store. Perfectly placed alongside the new distribution centre, the unit provides a larger, more accessible and soon to be more attractive environment than the existing Aldershot shop. More news on this coming soon! Albion London invites Gifford Grant back for more! After the success of the fit-out of an additional floor of offices in the Tea Building, Albion London have additional requirements refurbishing the 1st floor. Photos coming soon. CALA Homes move into new home after office fit-out in Staines, Middlesex. CALA House is the ideal office base for national house builder CALA, ideally situated for London, M3, M4 and M25, as well as Heathrow airport. The case study tells all. 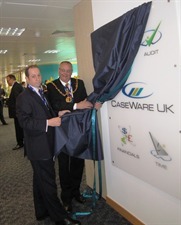 CaseWare UK's office opening last week was a great success. An excellent turn out, unveiling of its new sign, a lovely buffet of food specially selected from local producers and bubbles! The Mayor was the guest of honour and declared the office officially open. The office fit out in Maidstone, Kent provides Caseware with well appointed, spacious and ideally located UK offices and meeting facilities. View the full case study. Additional office fit out, London, SW1, for Gerard Daniels complete. More offices were created and meeting rooms formed for this valued client, adding to the extensive office refurbishment and fit out carried out in 2010. Komfort Polar glazed partitions and full height oak doors were selected to match existing finishes throughout the property. Additional Sven Christiansen furniture was supplied to new senior managers' offices. Work is progressing well on a total building and office refurbishment in Staines, Middlesex for CALA Homes (South). The project, due for completion towards the end of February, includes M&E replacement and upgrade, external refurbishment and office fit out, new staff welfare facilities including new WCs and staff tea points and breakout areas, new comms room and data infrastructure, new fire and security alarm systems, access control, and Komfort partitions and doors to form new reception, cellular offices, boardroom, meeting rooms and storage areas. Gifford Grant returns yet again... to carry out more work for its prestigious client HWM. Due to growth, HWM Alfa Romeo requires additional office space to be created within its existing Walton on Thames service reception. Work is underway and planned for completion by the end of January! For 10% discount on all on-line orders at The Stateside Candy Co go to http://www.americansweets.co.uk/ and quote GG10 when you place your order. Offer ends at midnight on New Year's Eve 2011. 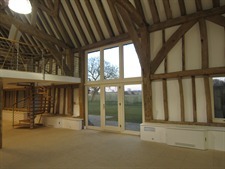 Oak Barn Veterinary Centre opened to the public, and their furry friends, on schedule and is now open for business! To find out more about this exciting new practice in a listed barn in Shalford, Guildford, Surrey take a look at the case study now. 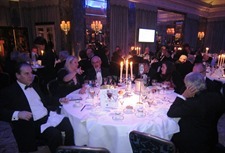 The 96th 100 Property Club Dinner at The Dorchester was a great success! We and our guests from Oak Barn Vets, Shalford, HWM Aston Martin, Walton on Thames and Broadlands Chartered Sureyors enjoyed the excellent food and entertainment from comedy legend Jimmy Tarbuck! This year 100 Property Club has donated another two buses, in partnership with Lady Taverners, for children with special needs – bringing the total to 48 in 24 years. ‘’Hi All, Just a brief note to thank you all for your most generous hospitality last night at the above. Great company, food and venue. The comedian wasn’t bad either!! Thanks again and a very merry Christmas to you all at GG. Regards. Shane. New projects awarded for fit out projects for: Magic Software, Bracknell; Caseware, Maidstone; and Albion Brand Communication, London. More news as these exciting projects progress! British Soft Drinks Association office fit out London completed on time and in budget to our usual exacting standards! New meeting facilities, offices, staff welfare facilities provide a practical and attractive new home for the BSDA. If you are thinking of refurbishing or fitting out your London offices… think now to avoid it being an ‘Olympic task’! The road closures associated with next year’s games will not be conducive to getting materials or labour into many parts of the City of London, so act on your plans now to avoid unnecessary delays and disruptions to your project! Like Dr Dolittle, we are talking to the animals! Well not quite, but we are creating a brand new veterinary practice in a listed barn in Guildford to provide a first class environment for our furry friends. An exciting and challenging project which will be ‘operational’ in October. Long standing client, Chantrey Vellacott DFK, appoint Gifford Grant to carry out the refurbishment of another floor of its Russell Square, London offices. Having carried out refurbishments of two other occupied floors, Gifford Grant were the obvious choice to carry out the next project which is all to be completed outside normal working hours. Congratulations to Managing Director Nicola Brown, now Forgette, and her new husband Paul on their recent wedding. It was a fabulous day and the bride looked radiant. The car, on loan from HWM Aston Martin didn’t look bad either – a lovely Aston Martin Rapide! 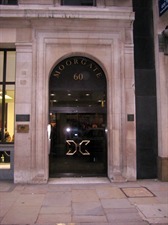 When leading independent leasing company, Deutsche Leasing UK Ltd, needed to make alterations to its five year old office space, Gifford Grant was called in to help. Having relocated the company previously, Gifford Grant was the natural choice to provide a swift and economical solution. 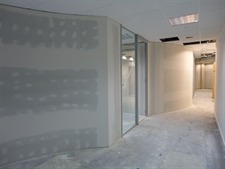 Only taking a total of three days on site, a new IT suite was constructed using stud partitioning, a full height maple veneered door with feature vision panel to match those previously fitted, electrics and data were installed, the new partitions decorated, and a fire safe was carefully moved to a new position with a reinforced floor. Fast track project in Reigate, Surrey completed and moved in ahead of schedule. The contract included construction of meeting rooms and board room using faceted glazed partitions and full height doors, installation of storage wall, data cabling, electric and air conditioning. Next: the dilapidations in the former offices. More auto sector success! 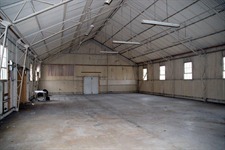 New project awarded to Gifford Grant to fit out a new service workshop for Heritage Aston Martin and Alfa Romeo cars. Updates on this exciting project as it progresses. Fast track fit out for Gerard Daniels completed on time and budget! Occupying an attractive period property near St. James' Park, the fit out needed to be sympathetic to the architecture of the building while providing attractive and functional work space. View the case study. Phase 1 of the fit out of Oxford based charity, Innovista, is complete. The second, and final, phase will commence in August. Project completion of Gomaco's new European headquarters, Witney, Oxfordshire. After total internal and external refurbishment Gomaco move into their new facility. Due to Gifford Grant's in depth knowledge of the property and ability to service all M & E installed, Gomaco has awarded Gifford Grant with an ongoing maintenance contract. View the case study. Gifford Grant is pleased to have been appointed to carry out the challenging conversion of a 'tin shed' into luxury suites on behalf of HHRC. Each suite will comprise living/sleeping area, storage facility and en suite wetrooms. Communal areas include living area with fireplace, dining room, kitchen and outdoor space with a covered terrace. Work has commenced to deliver this unique facility to an exacting standard within tight time constraints. Showroom fitted out by Gifford Grant used for launch of new Aston Martin Rapide. Gifford Grant’s recently retired Ian Brown attended the launch of the new Aston Martin Rapide, held at the premises of our client, HWM Aston Martin in Walton on Thames. The showrooms provided the perfect setting to introduce this stunning new car. Leading international professional services firm, Tescom, moved into their new London offices on schedule. Tescom, who provide software quality assurance and testing expertise, engaged Gifford Grant to undertake the fit out of its new UK headquarters in Moorgate, EC2. The project needed to be completed quickly, and this necessitated night work to maintain the challenging programme. Late legal completion of the lease further tested the project team, who rose to the challenge and commenced work on site within 48 hours of an order being placed for the project. Tescom is proud of its new premises which include cellular offices, boardroom, tea-point and a comms room. As one of Taylor Woodrow's preferred contractors, Gifford Grant provided a new partitioning solution for their global client based in Watford, Hertfordshire. Another fast track project completed on schedule with total client satisfaction! Taylor Woodrow were so pleased, we had further instructions for another project which was completed in December, again in occupied offices and out of normal hours. Access Communcations Ltd move into their new Guildford offices on time after fast track fit out and new furniture installation. The team is delighted with its new home! 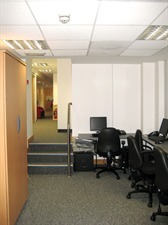 Russell Square office refurbishment completed ahead of schedule. Having been recently awarded a fast track refurbishment of 7,400 square feet of office space, our project team successfully delivered the new space to the client on budget and a week ahead of an already tight schedule. Another successful project completion, this time for a new Alfa Romeo dealership in Walton on Thames. Gifford Grant has an enviable reputation for completing projects to an excellent standard within tight deadlines, and this project was no exception. Working to both the dealer principal's brief and the manufacturer's specified finishes, the new showroom is complete and awaiting its first delivery of Alfa Romeos. In addition to this success, Gifford Grant has also been awarded a further contract to create a temporary service centre prior to further expansion. BAM Nuttall relies on Gifford Grant for further work at its Camberley site including: new designer furniture and service areas to compliment the training facility recently refurbished by Gifford Grant, and external works to enhance the look of the building, manage existing planting and improve the health and safety of staff and visitors to their Surrey facility. With the recent changes to the enhanced capital allowance scheme, less systems qualify for cost rebates. Gifford Grant can design a scheme that does comply, thus maximising what you can claim back through your taxable profits. BAM Nuttall’s training centre in Camberley, Surrey was completed within four weeks and handed over on schedule at the end of January. BAM Nuttall is delighted with its new facility and has praised both Gifford Grant and its appointed in house co-ordinator who said, ‘We have been delighted with their professionalism, attention to detail, and close involvement throughout the whole of the refurbishment project. That Gifford Grant attest to “Flexibility @ Work” is certainly borne out in our experience.' Gifford Grant looks forward to working with BAM Nuttall on future fit out and refurbishment projects in London and the South.